The latest figures from the Australian Bureau of Statistics shows that there were 309,582 births in Australia for the year 2012, 7,965 (2.6%) more than the number registered in 2011 (301,617). The preliminary estimate of births for the year ended 30 September 2013 (310,600 births) remained fairly stable, increasing by 1,100 births from the year ended 30 September 2012 (309,582 births). 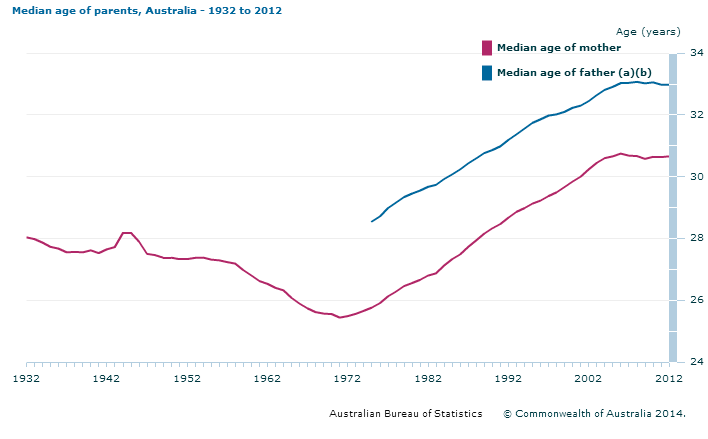 The lowest median age for mothers was in 1941 with a median age of 25.5 years. Since 1971, the median age of mothers has steadily increased every year until 2006 where the median age peaked at 30.7 years. The current median age of all mothers is 30.7 years. The current median age of all fathers is 33 years. 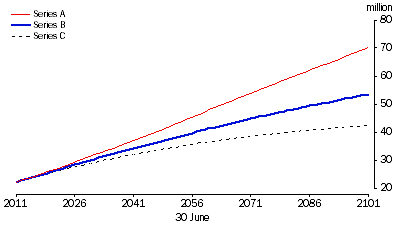 The projections made by the Australian Bureau of Statistics are not predictions or forecasts, but are simply illustrations of the growth and change in population which would occur if certain assumptions about future levels of fertility, mortality, internal migration and overseas migration were to prevail over the projection period. 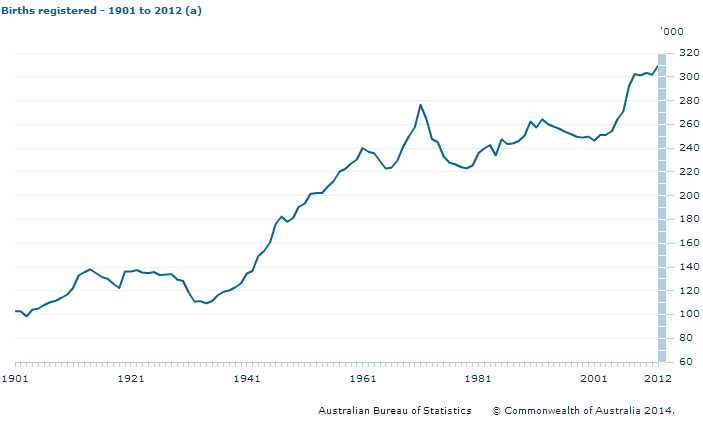 Australia's estimated resident population at 30 June 2012, is 22.7 million people. 310,600 births estimated for the year ending September 2013. The median age of all mothers for births registered in 2012 was 30.7 years, while the median age of fathers was 33.0 years. The median age of first-time mothers in 2012 was 29.1 years. 62% of first-time mothers were married at the time of giving birth. 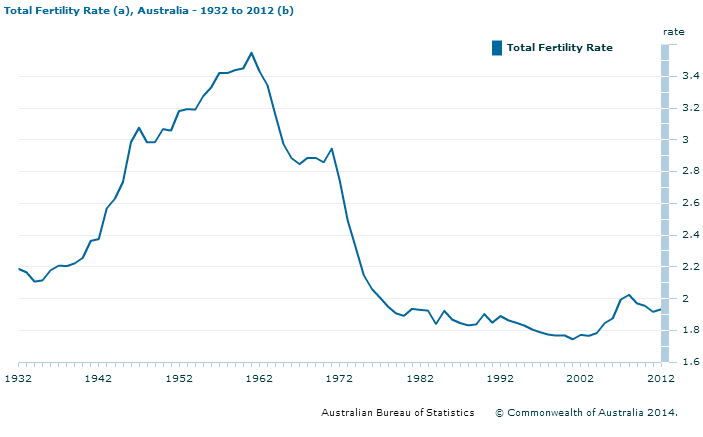 Of all births registered in 2012, 65% of births were to parents in a registered marriage. 51% of births were boys. 49% of births were girls. The ratio of male to female births is 105.6 male births per 100 female births. In 2012, there were 4,421 sets of twins born in Australia. 59 were triplets or of a higher order were born 2012.